I have a notoriously black thumb. I mean, it’s bad. If it would become any blacker, it would rot off and die, much like the few plants that I have tended. When I weed, I always manage to pull up the plants I’m supposedly protecting from invaders. Neighbors stopped asking me to water their plants for them while they were on vacation, giving the chore to more capable eight year old children instead of my adult self. I had a potted plant when I was in graduate school. I named it Seymour. For only being watered maybe five times, it did manage to last about six months before turning into dust. 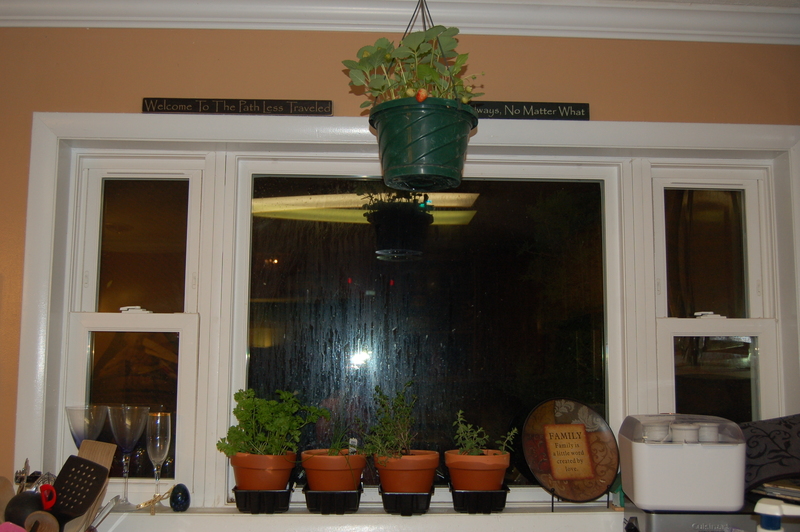 Last year, I thought I would attempt to “learn” how to care for plants by purchasing potted herbs and strawberries. You know, when the professionals say they need sunlight and water, would you believe that they actually do? They really mean it. I completely forgot. I could stand there, looking at them, get distracted, and forget to grab the watering can. However, I’m starting to become frustrated. The thing is, I’m working on a farm now, where I am surrounded by growing things, even in the middle of Winter and these “polar vortexes” we keep experiencing. I see these baby seedlings in the greenhouse, and it’s almost a sort of spiritual thing, if you will. You can’t be surrounded by new life and not be moved, compelled, to participate. I’m looking back on helping my Pap in his garden with nostalgia now. I’m looking at my yard, and I see wasted space instead of viewing it with apathy. I see others talking about the bounty they hope to reap this year during the growing season, and I want to have my own harvest–want to go outside and grab a sun-ripened tomato if I want it because it is mine, my tomato that I grew (with Nature’s help, of course). I’ve found myself inspired. I yearn to be able to join in the creation and growing process, to feel dirt between my fingers, to smell the earth, to tend, to watch something grow from the ground, from a little seed, into something that is nothing short of a miracle. (And let’s be honest…I’m not hopping on the baby train any time soon. This mama has hit her maximum capacity with little ones.) I want to be able to rely on my own work for vegetables and herbs, instead of being forced to depend on someone (or something) else for my food all the time (admittedly, I love supporting local farms, but the celery I bought from the grocery store the other day was grown by a company with “LABS” at the end of it…….my food was made in a LAB?). So, that evening, I hopped onto the Johnny’s Selected Seeds and Seed Savers Exchange websites, and I ordered seeds. There are seeds for strawberries, radishes, carrots, hot peppers, chives, thyme, oregano, basil, mint (herbs will be potted), onions, tomatoes, and peas (the peas can be potted, too, apparently). I haven’t a clue what I’m doing, and I’m sure there will be more loss than success, but sooner or later, I’ll have a harvest of my own, with renewed effort and motivation. Everyone has to start somewhere, right? The seeds of change have to be sown sooner or later. And maybe, just maybe, I’ll be able to reap what I sow. Dawn at Goodness Grows (where we have our CSA) mentioned she has nine acres of plants to tend. That seemed so massive to me, as someone very new to gardening. 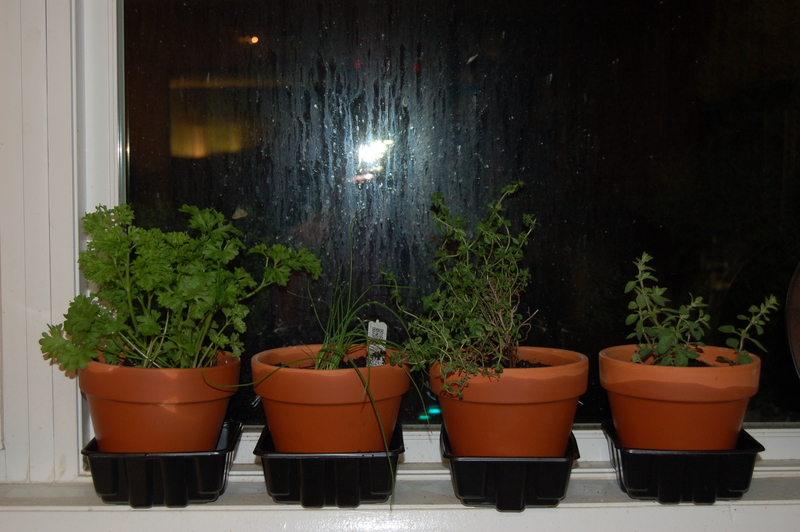 These beauties are my “nine acres”–thyme, parsley, chives, oregano, and strawberries. 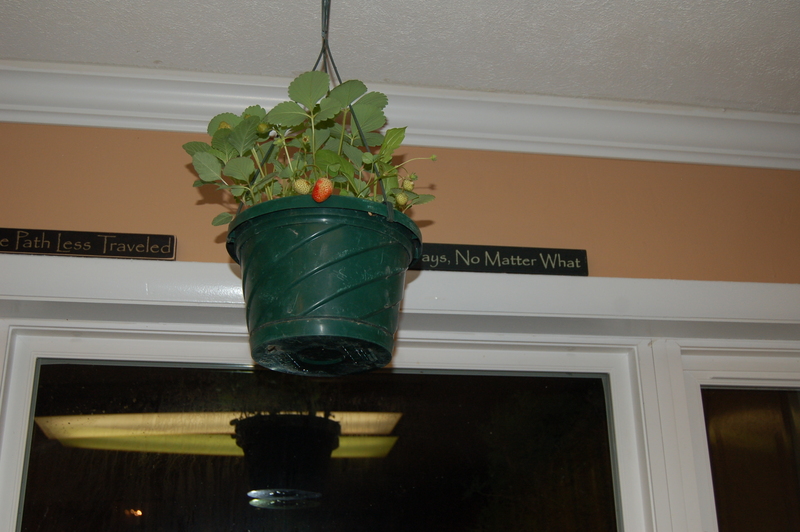 We will be lowering the strawberries to get more light, and if that isn’t enough, they will go outside. 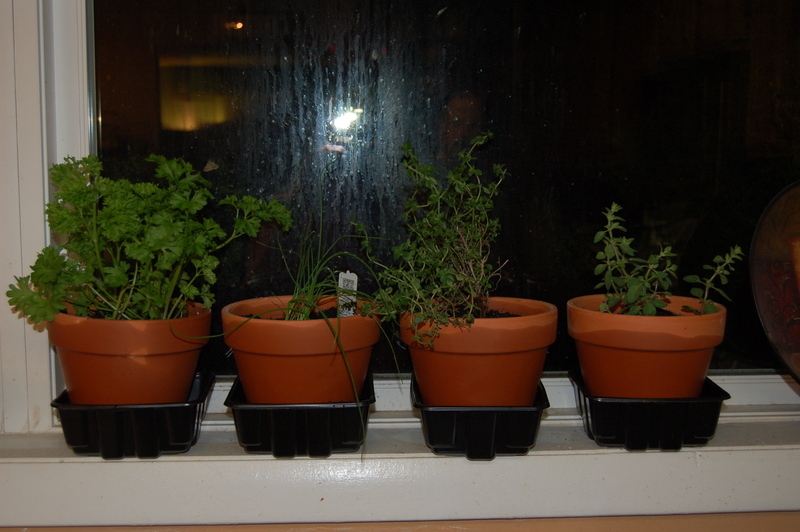 So, in addition to my hanging basket of strawberries, and the little pots of oregano and thyme upon my windowsill, I have purchased two more small pots–one of parsley, and one of chives. 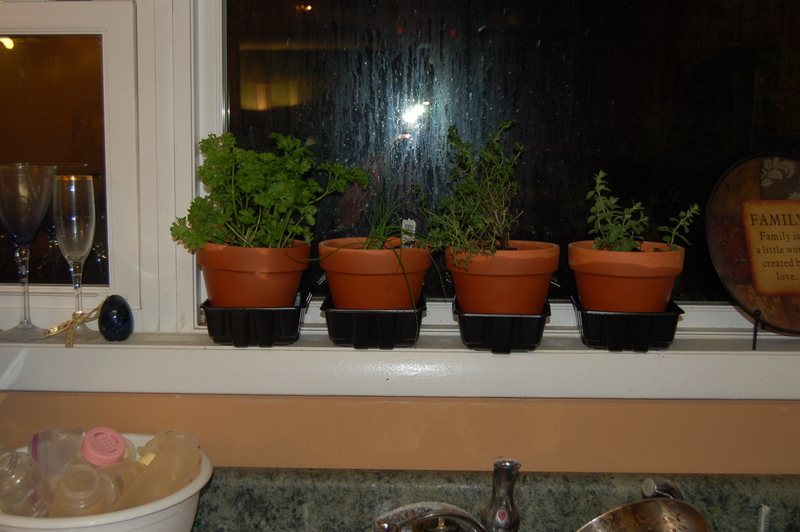 I’m hoping I’m not getting too far ahead of myself, but I just love the idea of having fresh herbs handy in my kitchen. 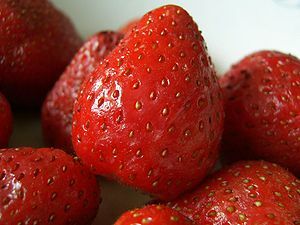 And they taste so fresh and yummy when I sample them. 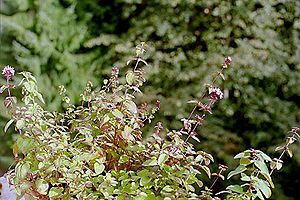 I’m a big believer in herbs and spices in cooking–I love doctoring my food–and when I tasted the thyme and oregano yesterday at the farm, I mean, how can that even remotely compare with dried, ages old, store bought and bottled spices? We’ll see whether they survive transplanting, and my black thumb. But, it’s safe to say that I’m definitely intrigued with growing my own produce–and when I can’t, or the idea seems daunting, there are always local farms to visit! It is a known fact that I am not a naturally born gardener. I’m a total black thumb. I’m great with animals–okay, I’m acceptable with animals–but I just cannot keep plants alive. They intimidate me greatly. There’s planting, and worrying about the weather, and weeding, and maintaining with food, water, and sun, and worrying about soil quality, and everything else. It is so daunting! My friend Brandi and I were going to take an herb gardening class this morning, but plans changed, and we both had babysitters and extra time, so, in addition to some bulk and discount food shopping, we went to Goodness Grows (the farm where I have my CSA, as I’ve mentioned before) to try to find a couple plants that we could bring home. We both left with hanging baskets of strawberries, and I also brought home two little pots of herbs–one of citrus thyme and the other of Greek oregano–which I will transplant into something more permanent later. Both herbs taste divine (I’ve already sampled), and there was one little strawberry already ripened in my basket (also sampled). We talked with Dawn, the owner of Goodness Grows, about her operation (and other things related to farming, gardening, sustainable living/eating, etc), and she mentioned that she has nine acres of vegetables and plants to weed and maintain. I blurted out, “Well, these three pots of mine will be my nine acres.” Sometimes, I don’t think it’s about the abundance of what we do, nor the bounty of our harvest, or the success, but rather, that we try. I’m actually, to be honest, scared to take on this endeavor, but if I don’t try, then what happens? I’d rather try to grow a green thumb than to live with a black one. And if all else fails, I’ll get to have a few of these…..